BAHRAINI rider Ahmed Hamad Al Ruwaihi of Al Talia Stable was crowned the overall champion in the season's last endurance horseride championship which concluded yesterday at the Bahrain International Endurance Horse Riding Centre in Sakhir. Riding High Roller, Al Ruwaihi overcame a shaky start to become the overall winner in five hours 14 minutes 10 seconds. In second place was Saudi Arabia's Fawaz Al Dahrani (5:36:27) on Wargan, while third place went to Ahmed Al Hemaidi (6:04:61) of Qatar who rode Ibn Az Al Khal. The race was the first held at night and was over 100-km, divided into four stages with 46 riders from Bahrain and the GCC in the fray. Bahrain Royal Equestrian and Endurance Federation president Shaikh Nasser bin Hamad Al Khalifa flagged off the first stage, which was over 30km, at 5pm on Wednesday. Shaikha Najla bint Salman Al Khalifa from Ahmed Al Fateh Stable rode Al Jassi to finish first in this stage clocking 1:18:16 minutes. Saudi rider Saud Jaber (1:23:16) on Bahar was second and Al Hemaidi (1:24:45) came third. The second stage, also over 30km, saw Shaikha Najla extend her lead as she finished in 1:29:38, followed by Saudi Arabia's Abdulla Al Hawas (1:22:53) and Jaber (1:28:45) in second and third respectively. Al Hawas on Reemah performed well in the third stage, which was over 26km, and finished first in 1:18:02, ahead of Al Ruwaihi who advanced to second place in 1:18:48, while Al Dahrani moved to third after finishing in 1:30:12. The fourth and final stage over 14km saw Al Hawas finish first but was disqualified after failing to pass the veterinary test performed after the race and second-placed Al Ruwaihi was crowned champion. Shaikh Nasser gave away the prizes at the presentation ceremony. Results (in order of horse, stable, total time): 1 Ahmed Hamad Al Ruwaihi (High Roller, Al Talia Stable, 5:14:10); 2 Fawaz Al Dahrani (Wargan, Saudi Arabia, 5:36:27); 3 Ahmed Amroo Al Hemaidi (Ibn Az Al Khal, Ali Ahmed Al Hamidi, 5:56:33); 4 Jaffer Mirza (Al Fahd, Al Muqheeraat Stable, 6:04:61); 5 Jawad Radhi (Al Batr, Jawad Radhi, 6:46:35). Bahrain: Last Race of Endurance Season to be night ride!! THE last race of the endurance season, organised by the Bahrain Royal Equestrian and Endurance Federation, will take place today at 5pm at the Bahrain International Endurance Horse Riding Centre in Sakhir. More than 65 riders from Bahrain and the GCC will take part in this event which will be the first to be held at night due to the high temperature during summer season. The 100km race will be divided into four stages. The first two stages will be over 30km each, 26km for the third and 14km for the final stage. There are 13 riders from Qatar, five from Saudi Arabia and over 50 from Bahrain. The event will also feature two qualifying races which are warm up races for new riders to test their abilities and skills for such competitions. The first race will be over 80km in which five riders are taking part, while the second is 60km with three riders in the fray. Bahrain Royal Equestrian and Endurance Federation president and Royal Endurance Team leader Shaikh Nasser bin Hamad Al Khalifa and second vice-president Shaikh Nasser bin Hamad Al Khalifa, who will not taking part in the race, will patronise the event. Among favourite Bahraini riders for the event are national team members Ahmed Hamad Al Ruwaie and Jabr Al Dossary, both from Al Talia Stable. Other stables participating in today's event are Al Asayel Stable, Al Salam School, Al Fateh Stable, Public Security and Sa'ar School. I am pleased to announce you the July 10th 2004 new CEI** in South West of France. Riders? entries are most welcomed. This new endurance race will be run with a new automatic timing and race management system giving error free professional results and allowing a follow up of riders on the trail, etc. (More information is available on our web site). 160km NEWMARKET RACECOURSES' BRITISH ENDURANCE NATIONS CUP 2004 and the NEWMARKET ENDURANCE CHALLENGE TROPHY 2004 to be run on 27th June 2004. The Endurance Committee, welcoming its two new Members Pierre Cazes (FRA) and Allan Renner (AUS), met for its annual meeting at the occasion of the La Baule Endurance CEIO in France. The meeting dealt with a wide range of topics including the appointment of officials for the various 2005 and 2006 Championships, the appointment of an Endurance Steward General and the, soon to be introduced, system to ?Star Rate? all Endurance Officials. The main part of the meeting was taken up by the extensive review of the Championship qualification criteria for horses and riders which was the subject of a ruling over the existing wording, issued by the FEI in March. National Federations had been requested to provide input ahead of this meeting and the suggestions received from seven Federations were considered as part of this process. Additionally the committee continued its examination of the introduction of a qualification system for Nations wishing to take part in World and Continental Championships. Two proposals for Nation Qualification were discussed and these, together with the new individual qualification criteria will be circulated to all Endurance National Federations for their comment in the near future. The Committee members expressed their appreciation to the Organising Committee who generously provided the facilities and support to enable the meeting to take place at La Baule. Music Skyline Pigeon, of Sir Elthon John, describes the tracks of the race of Joinville: "Turn me loose from your hands, let me fly to distant lands, over green fields, trees and mountains, flowers and forest fountains..."
Each loop presented a challenge to the riders and the natural beauties of the region had enchanted all of them: the passage of a river, fields of rice, roads, mountains... Placed between the hills and the sea, the city has got natural beauty and a cultural heritage that charms all riders. The results for the 2004 runing of the Biltmore Estate Challenge are available. Stagg Newman on Jayel Super perfomed a clean sweep of the 100 mile event with a first place finish for both FEI and AERC Open divisions as will as the IAHA Regional Championship. Jayel Super was awarded Best Condition as well. All of the results, with images and commentary are available. The ladies ruled the day at La Baule, France May 8 when 21 yr. old Italian rider Diana Origgi, riding the 8 yr old Jasmineh (Falstaf x Desire Delia Gazza) won the ride in a ride time of 9:07:43. Sophie Arnaud from France riding Dalton Du Capimont ( Jano x Missmis) came in 2nd, while Angela Origgi (It) riding Jadana ( Dotek x )took third place. 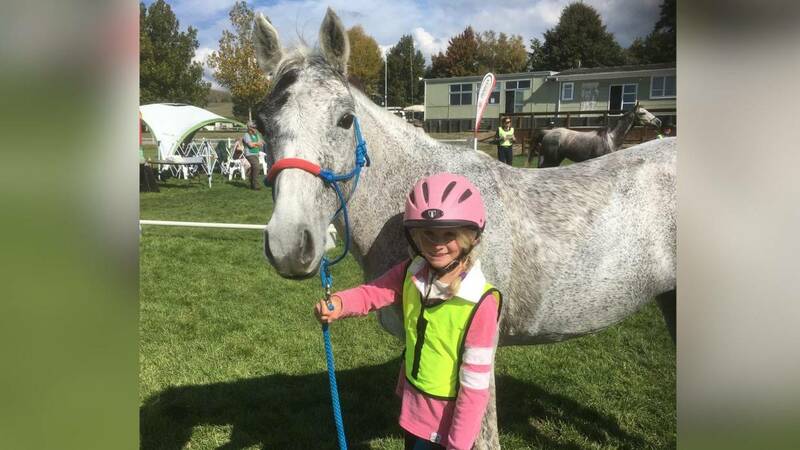 Diana Origgi said her ride went very well, and even though it was the first 160 km for both she and her horse, they were both experienced at smaller rides and well prepared. Italian Chef d$(Beq(Buipe, Sergio Tommasi, said that he had not placed Diana on the Team, as neither she nor her horse had as yet completed a 160 km ride. This did leave her with the opportunity to compete a bit harder. When the 3rd team member was eliminated early in the ride, he gave her 26 yr old sister, Angela, the go-ahead to ride more competitively as well. I arrived now in São Paulo. The extra tropical cyclone get the access to Internet dificult...there was not how to access internet. I'm sending now the results and photos and article later. Thanks a lot and a hug. I have placed the results on-line. It sounds like it may have rained. There were 17 completions out of 33 adult rider starts (over all distances). There were 8 completions out of 9 starts in the Young Riders division (overa all distances). Belgium captured the Team Gold at the 2004 La Baule CEIO*** Endurance Race today. The Belgium team finished three riders/horses in the competition to achieve and overall combined time of 31:28:57. Portugal achieved the Silver position and host France, finishing 2 riders/horses, received Bronze. Stagg Newman riding Jayel Super finished first in the 2004 Biltmore Estate Challenge 100 Mile Endurance Race. Newman bested a field of 78 competitors to finish the course in the dark at 21:53 with a ride time of 12 hours and 3 minutes. Earlier in the day, Karen Freer riding HMS Short Stack completed first in the 50 mile event. Hi!..I am just back into the Press room....they will close this in about 1/2 hours...so I will send you the first 6 in...the rest are still arriving...whatever else I can get out...and more tomorrow. Here I am at Biltmore...actually been there all day, now it’s 11PM and I’m at a Kinkos trying to transfer photos. First off I have some retractions to make. That’s what I get for starting my coverage from home. >g< First, the FEI people no longer get the good parking places near the vet check. They've been exiled to Siberia...the very far end of camp. Fortunately they took their scales with them so they didn't all have to drag their tack down to weigh. It'll be near impossible to stop at the trailer to get anything they don't have at the check though since it's about ½ mile to the trailer. There is one sizable climb on this loop but for the most part the altitude changes at Biltmore are more like running up and down two or three flights of stairs all day than climbing up the Empire State Building and back down. After going through the woods you emerge near one of the, honest to goodness "charming" estate caretakers cottages. If you're lucky they may even have a water trough out at the road for you. One of the water troughs comes complete with a pen full of cows right beside it and they find endurance horses fascinating. They especially love to stare until a horse finally risks dropping his nose for a drink, then they explode in every direction...every year it's the same. They love that trick. You have one of your first asphalt crossings and may ride the verge of the road at times on this loop. I cringe every time our 200 horses hit these groomed shoulders but I guess they know what they're in for when they let us on the place. the day of the ride, it should make for excellent riding conditions. WOW! 81 starters in the 100. That's HUGE!!! I'll be heading up to Biltmore EARLY Friday morning and will be posting back to you guys any way we find to get it here. I've got my whole family lined up to work Friday and between Bill photographing, me with the tape recorder, laptop, pen and pencil and cell phone and Bonnie & Josie acting as runners (drivers) to hopefully take my disk to the nearest internet access. The mountains are steep and close in at Biltmore so John may be hearing a whole lot of "Can you hear me NOW?" I've entered 11 rides on the Biltmore course and have 9 completions. Kaboot got thumps back in 97 after I tried some old non-endurance electrolytes (was running 4th at the 40 mile mark), then pulled "rider option" in 02 the year that it rained so hard the night before that they dropped the 100 down to 80 and it rained buckets all day. My horse was good at 40 miles but the trail and conditions weren't so I decided to option out when the nominated horses did. I've top tenned twice in the 50, and completed 3 100's...the fastest in 13:27. So, there's my resume' for commentary. I may not be the person to ask how to win the ride, but I've got a pretty good idea how to get through it and what the challenges are. Since I'm having to be an "at home" armchair commentator right now, I just thought I'd describe what it's like if you're a first timer. If you're looking for commentary on this year's entries that'll be coming later. The starters list for the 2004 LaBaule CEIO*** event provides an opportunity to review the endurance teams from 5 countries as well as the depth of the endurance community in France. There will be 47 starters from 8 countries. We will see the teams from Belgium, France, Italy, Portugal, and the UAE compete for team honors. The event is also a part of the honeymoon for the newly betrothed His Highness Shiekh Mohammad Rashid Al Maktoum and Her Royal Highness Princess Haya Bint Al Hussein of the United Arab Emirates and Jordan respectively. Competing in a 160km endurance race on one's honeymoon is certainly one of the marks of enthusiastic endurance family. The tentative starters list for the 2004 Biltmore Estate Challenge is available. There are 81 starters in the AERC Open 100, 45 FEI CEI***(100M) starters, 117 AERC Open 50, and 3 CEI**(50M) starters. The weather is changing from wet/cool to clear/hot (humid??) for Saturday with thunder storms forecast for Sunday. All 10 USEF National Endurance Team members will be riding in the 100, although not all in the FEI division. Riders from 8 countries will be taking the Challenge. Persik, who stood in France from 1975 until 2001, is considered by many to be one of the best producers of endurance horses, able to pass his numerous good qualities to his famous get. These include endurance greats, Kid, Loustik, Makonia, Tex, Outlaw Persik, Varoussa, Dynamik, SyI?ne of Dr?mme, Melfenik, and Krempolis, to name a few. Persik was imported from the Russian racing stud, Piaygiorsk, at Tiersk, by Jean Cougul along with two mares. 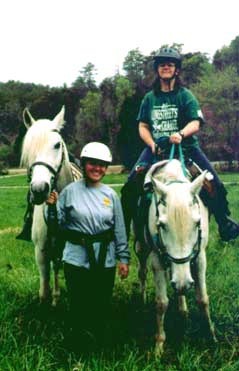 In 1972, equestrian tourism was on the rise in the south of France, and riders and park rangers needed horses. According to historians, the stallion Persik, was a stand-out. The 15.3 h, grey was from the Skowronek line, with Nasseen on the paternal side and Arax on the maternal side. Dikarka, great-grandmother to Persik, is the mother of famous Padron in the USA.